True leadership isn't a matter of having a certain job or title. In fact, being chosen for a position is only the first of the five levels every effective leader achieves. 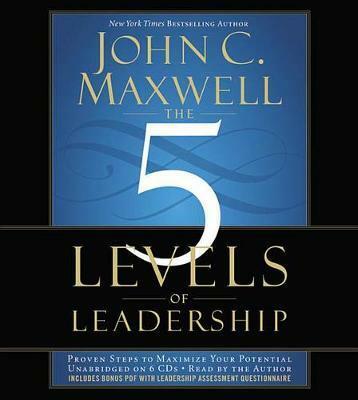 In his seminal work, leadership guru John Maxwell presents readers with the five stages of leadership and explains how to maximize each one to become more influential, respected and successful: 1. Position - People follow because they have to. 2. Permission - People follow because they want to. 3. Production - People follow because of what you have done for the organization. 4. People Development - People follow because of what you have done for them personally. 5. Pinnacle - People follow because of who you are and what you represent. John C. Maxwell is an internationally respected leadership expert, speaker, and author who has sold more than 20 million books. Dr. Maxwell is the founder of EQUIP, a non-profit organization that has trained more than 5 million leaders in 126 countries worldwide. Each year he speaks to the leaders of diverse organizations, such as Fortune 500 companies, foreign governments, the National Football League, the United States Military Academy at West Point, and the United Nations. A New York Times, Wall Street Journal, and Business Week bestselling author, Maxwell has written three books that have sold more than a million copies: The 21 Irrefutable Laws of Leadership, Developing the Leader Within You, and The 21 Indispensable Qualities of a Leader. His blog can be read at JohnMaxwellOnLeadership.com. He can be followed at Twitter.com/JohnCMaxwell.